The U.S. Forest Service is warning drivers to exercise caution when driving on certain roads in the Grandfather Ranger District of the Pisgah National Forest. Recent heavy rains have damaged the following roads on the Grandfather Ranger District. These roads are open to the public; however, drivers should proceed slowly and with caution as the roads may have gullies or potholes. Drivers may encounter graders and other heavy equipment working on these roads and other roads on the district. The following Grandfather Ranger District roads received significant damage by recent heavy rains. Sections or entire lengths of these roads have been closed to the public. The Forest Service is working to repair these roads. 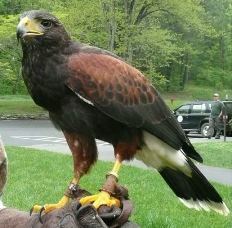 Great Smoky Mountains National Park is teaming up with the Balsam Mountain Trust for a special program on Birds of Prey to be held at the Oconaluftee Multipurpose Room on Thursday, June 6th. Michael Skinner, Executive Director of the Balsam Mountain Trust, will conduct an hour-long Birds of Prey program beginning at 1:00 p.m. This program will provide visitors with an up-close glimpse of some of the planets most recognized and revered wild animals such as the tiny Eastern Screech Owl and Northern Bald Eagle. The Oconaluftee Multipurpose Room is adjacent to the Oconaluftee Visitor Center on U.S. Highway 441, 2 miles north of Cherokee, North Carolina. For more information on the upcoming Birds of Prey program, please call the park’s Oconaluftee Visitor Center at (828) 497-1904. Great Smoky Mountains National Park will celebrate the 21st Annual National Trails Day on Saturday, June 1st with a volunteer opportunity to participate in an Appalachian Trail Work Day. The Park will once again work with the Friends of Great Smoky Mountains National Park, the Regional Office of the Appalachian Trail Conservancy, and the Smoky Mountain Hiking Club to host this large volunteer event. This work day event has taken place in the Park for the last 17 years and highlights the importance of trails to recreation, education, and physical fitness as well as recognizes the important work performed by trail volunteers. During 2012, the park recorded over 30,000 volunteer hours of time to help maintain the over 800-mile trail system. Appalachian Trail Work Day provides an opportunity for the public to help care specifically for sections of the AppalachianTrail (AT). 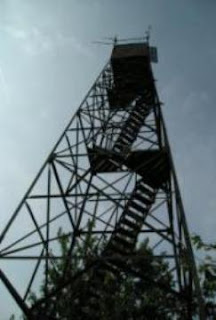 Volunteers will be assisting in such work as the cleaning and replacing water bars, rehabilitating steps and turnpikes, and generally helping to main trail tread on sections of the AT between Icewater Springs Shelter and Silers Bald, Davenport Gap going south and NE from Low Gap. The work day concludes with a barbecue picnic at Metcalf Bottoms Picnic Area for all registrants who will also receive a commemorative t-shirt. A registration fee for this activity will apply which goes to sponsor trail projects in the Smokies. Participants should wear sturdy shoes, bring lots of water and a lunch for the day. For more information or to obtain a registration form, visit the Friends of Great Smoky Mountains National Park website or contact Holly Scott at 865-932-4794. During the 1960s and 1970s, Maryville physician Elgin P. Kintner often hiked into the Great Smoky Mountains and captured the breathtaking views with his camera. Once the photographs were developed, he pasted them together, carefully matching them to create panoramic displays. Kintner created these extraordinary views by taking several photographs in sequence and then arranged them in order to make panoramic images. At the time the scenes where shot in the 1960s and 70s, the panoramas could only be created by hand. Using modern technology, the images were scanned and then "stitched" together to create seamless panoramas. The public can now enjoy these photos, courtesy of the UT Libraries. The library staff has transformed them into an online digital collection. “The Panoramic Images of Elgin P. Kintner, M.D.” can be viewed at the library’s website. Thanks to Randy Small for giving me a heads-up on this! In conjunction with National Trails Day, Tennessee State Parks will host free, guided hikes on Saturday, June 1, encouraging outdoor enthusiasts to participate in several planned activities across the state. Each state park will host its own special hike, offering a variety of family-friendly activities including historical hikes, educational programming, re-enactments and wildlife watching. “Tennessee State Parks will offer a variety of interesting hikes across the state and we encourage everyone to join us on this great day to fully appreciate what our 54 state parks have to offer,” said TDEC Commissioner Bob Martineau. From Fort Pillow to Standing Stone to Warriors’ Path and every state park in between, the National Trails Day hikes are designed for all ages and abilities. Some hikes will be approximately one mile in length and tailored for novice hikers, while others are lengthier and geared toward more experienced hikers. 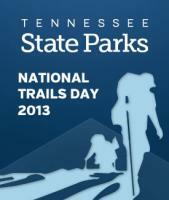 For a more in-depth look into planned National Trails Day events in your area, please visit www.tnstateparks.com. In addition to the variety of events planned throughout the weekend, an official Tennessee State Parks’ hiking stick medallion will be given away to the first 1,500 participants statewide. All events are scheduled for Saturday, June 1, and all times are local. Participants should bring water and food, and wear long pants and appropriate footwear. Some activities require reservations, so please call to ensure an opportunity to participate. The upcoming National Trails Day hikes represent the third in a series of statewide hiking events for 2013 – joining Tennessee State Parks’ First Hikes effort in early January, and Earth Day celebrations in April. Tennessee State Parks will hold an additional hiking event this fall during National Public Lands Day on September 28. For more information about Tennessee State Parks, please visit www.tnstateparks.com. For a free brochure about Tennessee State Parks you can call 1-888-867-2757. 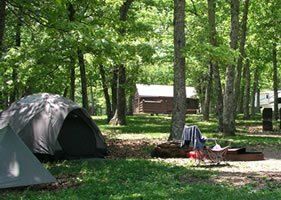 Effective June 1st, price increases for camping in the year round Wilderness Road Campground at Cumberland Gap National Historical Park will take effect. Camping rates for sites without electricity will increase from $12.00 to $14.00, and sites with electricity will increase from $17.00 to $20.00. Sites will be one half price for those having an Interagency Senior or Access Pass. Group campsites will increase from $30.00 to $35.00. This is the only campground in the park that allows vehicle access and which provides bathroom and shower facilities. Park Superintendent Mark Woods explains the camping price increases as the first since 2002. He further spells out that "a comparability study, involving local state parks and private organizations with similar operations was conducted and that price increases will bring Cumberland Gap more in line with the price structure of the local community and the businesses that are similar in nature to the park's. This price adjustment will remove any possibility of the park unintentionally undercutting local and regional businesses." Woods shares an exhaustive list of major improvements made over the past ten years to the 160 site campground which is enjoyed annually by an average of 103,395 visitors. "In May 2012, we completed a six-month $861,690 project which involved the installation of new water and wastewater systems within the campground. This was essential to improve the efficiency of park operations by reducing maintenance costs and costs related to deficiencies in the condition of the existing systems, provide a safe and healthy environment for both visitors and park staff, remove a potential source of surface water contamination and protect park natural and cultural resources and values. The new system includes 4000 linear feet of leach field trenches, four new septic tanks, new sewer pipe throughout, and eight new sanitary manholes. Six monitoring wells were also installed around the leach field. Flow meters were installed to more accurately monitor the water usage at each comfort station." "Hi Friends. We just left your fabulous facility after our 5th stay for the Dulcimer Gathering. The beauty of the campground was enhanced by your staff's attention to the washrooms and the amphitheater too. This is our favorite campground! Thank you." For more information about Cumberland Gap National Historical Park and camping opportunities, please call (606) 248-2817 or visit www.nps.gov/cuga. The Big South Fork National River and Recreation Area has announced a 45-minute, ranger-led interpretive program about Big South Fork's largest mammal: the American Black Bear. Come and enjoy an evening outdoors with Ranger Debby Zimmerman at the campfire circle to learn more about a myriad of bear-related topics such as historical relationships with human cultures, black bear biology, how to stay safe in bear country, and your role in keeping bear populations wild. This fun, fact-filled evening activity begins promptly at 7:30 p.m. (EDT) on Saturday, June 1, at the Blue Heron Campground. Everyone is welcome to this campfire circle program, which is free of charge and wheelchair accessible. The park asks that you wear weather-appropriate clothing. For directions or additional information, please call the Blue Heron Interpretive Center at (606) 376-3787. Great Smoky Mountains National Park officials announced that a project to repave 6.1 miles of Newfound Gap Road will begin in May. This work is part of a multi-phased rehabilitation project that started in 2007. The section to be resurfaced extends from Chimney's Picnic Area south to an overlook approximately 2 miles south of the Alum Cave Bluffs parking area where the last phase ended. The work will be performed under a $13.2 million contract with Estes Brothers Construction of Jonesville, VA and will be administered by the Federal Highway Administration's Eastern Federal Lands Highway Division. Funding is provided to the NPS through the Federal Lands Transportation Program to support this work. Park Superintendent Ditmanson said, "In developing this contract we made every effort to minimize the disruption to visitor access to Park attractions and to our gateway communities. The contract incorporates a variety of work restrictions that are tailored to minimize lane closures during the busiest periods." Motorists should expect delays due to lane closures through June 15. There will not be any daytime lane closures from June 15 through August 15. After August 15, daytime lane closures will again be allowed. No work of any kind will be permitted on federal holidays or during the month of October. This section of road was last repaved in the 1980s and is badly deteriorated. In addition to the repaving, major work items in this project include the replacement of drainage culverts and the repair of several guard walls. This work is the second of three phases to repair all 15 miles of the Road from Newfound Gap to the Park boundary at Gatlinburg - a process that Park managers expect to finish in 2016. For more information about road closures, please call the Park's Road and Weather Information Line at 865-436-1200. 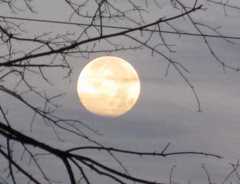 Tomorrow night, May 23rd, will be another "Full Moon Hike" in Cades Cove of the Great Smoky Mountains. This is an excellent opportunity to take a stroll in Cades Cove under the light of a full moon. If interested, visitors should meet at the Orientation Shelter near the entrance to the Cades Cove Loop Road. The hike will take place from 8:30 PM to 10:30 PM. The park asks that you wear good walking shoes, bring water and a flashlight. Children under 14 must be accompanied by an adult. The event is subject to cancellation due to hazardous weather. Over the past several years, rangers from Blue Ridge Parkway and officers from the US Forest Service have discovered evidence of active gem mining and mineral collection at numerous locations along the parkway, and on adjacent USFS lands. The two agencies coordinated efforts to monitor the locations, in part with surveillance equipment. On October 13, 2012, rangers saw a man mining one of the sites and identified him as Christopher Barrett, of Asheville, North Carolina. Over the next few months, two other men – Elliott Shope and Thomas Hill, also from Asheville – were also found mining. All were arrested and charged with illegal removal of mineral resources. On February 26th, Barrett and Shope appeared in court and were fined $1,200 each for removing mineral resources; on April 30th, Hill appeared in court and was fined $500 for removing mineral resources. The investigation continues. 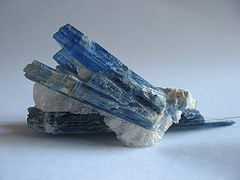 The convicted men said that gems and minerals, particularly kyanite, are being traded and sold at local gem markets and are used in jewelry production. NPS Digest also recently published a report that a man was arrested for harvesting galax along the Parkway. Last fall, rangers on several occasions saw a silver Toyota Camry in areas along the parkway known for illegal galax harvesting. An inspection of the vehicle led to the discovery of twist ties and other items used in galax harvesting. On November 17th, rangers saw the same vehicle on the parkway and contacted the driver. He was found to have 4,140 galax leaves in his possession. The man also had been cited previously for commercially harvesting galax by the US Forest Service. On April 30th, he pleaded guilty to possession of galax and was sentenced to 30 days in jail. Got a bold idea for an expedition? Outside Magazine is willing to give you $10,000 towards your ultimate adventure dream - if you can encourage enough people to vote for your idea. To drop your name into the hat, all you'll need to do is submit a proposal by June 1st. Included with your proposal will be an essay, no longer than 500 words, a photo of yourself, and a video of two minutes or less. Outside editors will then select a handful of finalists and post the videos online so that readers can vote on the winner. Last year the magazine received several hundred applications, while thousands of readers voted in the contest. 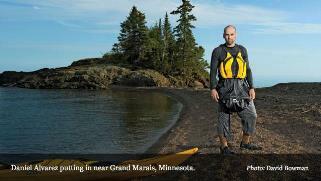 Last year's winner was Daniel Alvarez, a former corporate lawyer (pictured above) who paddled a sea kayak from Minnesota to Florida. 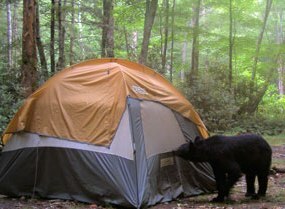 Next Saturday there will be a program on "How to Keep Yourself Safe and the Bears Out of Trouble" at the Big South Fork National River and Recreation Area's Bandy Creek Campground. The evening program about black bears will be held at the Bandy Creek Campfire Circle on Saturday, May 25, at 7:00 p.m. (EDT). People of all ages can learn how to keep safe in bear habitat of Big South Fork and the surrounding area and gain an understanding of how human behavior can impact bear behavior. Visitors will learn what to do if they see a black bear, how to store food at a campsite, and how to "bear-proof" private property. The Campfire Circle can be found by entering Bandy Creek Campground and turning left toward Area A. Across the road from the swimming pool parking lot, a trail leads to the Campfire Circle. For more information, contact the Bandy Creek Visitor Center at (423) 286-7275. The Department of the Interior has announced the start of the 2013 "Share the Experience" contest, giving amateur photographers the chance to join the ranks of Ansel Adams, Thomas Moran, and others who have found recognition for their photographs of the nation's public lands. The "Share the Experience" photo contest showcases our nation's public lands, including national wildlife refuges, forests, recreation areas and our national parks, such as Glacier, Rocky Mountain and the Great Smoky Mountains, and draws entries from all across the United States. It is the largest national park and public land photo contest for amateur photographers. The winning photograph will appear on the 2015 America the Beautiful pass for entrance to 2,000 federal recreation sites, including national parks, national wildlife refuges, and national forests. All entries have the chance to be featured on the Interior Department’s popular Twitter, Instagram and Facebook accounts. 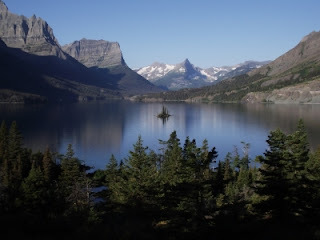 Prizes provided by the National Park Foundation, Active Network, Air Wick and Historic Hotels of America include a $15,000 cash prize, a Columbia backpack, a pass to the national parks and other federal lands, and other items for the grand prize winner. Second and third place winners, as well as 7 Honorable Mention winners, will also receive prizes. The "Share the Experience" begins May 10, 2013 and runs through December 31, 2013. Amateur photographers can participate by uploading photos on www.sharetheexperience.org. "Share the Experience" is sponsored by Active Network, Air Wick, Historic Hotels of America and the National Park Foundation in partnership with the National Park Service, the Bureau of Land Management, the Bureau of Reclamation, the U.S. Fish and Wildlife Service, and the U.S. Forest Service. To view the 2012 contest winners as wells as the contest rules and a complete list of prizes, please see www.sharetheexperience.org. 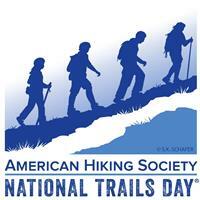 In less than three weeks, on June 1st, the American Hiking Society will celebrate its 21th National Trails Day. More than 2000 events across the nation will take place, including trail maintenance, hiking, paddling, biking, horseback riding, bird watching, running, trail celebrations and many other trail related events. The U.S. Forest Service today announced the recent completion of work to repair the scenic Max Patch area of the Appalachian Ranger District, Pisgah National Forest. The Appalachian Ranger District collaborated with a number of volunteer organizations including the Appalachian Trail Conservancy, Carolina Mountain Club and Appalachian 4x4 Club to repair parts of Max Patch. 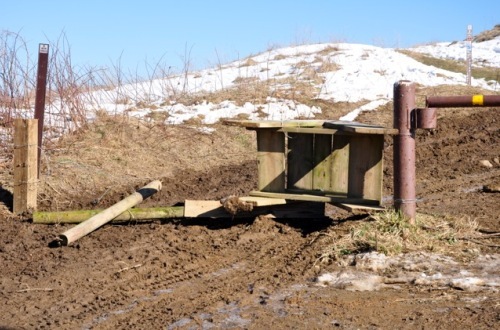 Last winter, damage occurred to the Max Patch area when off-highway vehicles were driven in the area. The people responsible for the crime were found and cited. The Forest Service and volunteers worked together to design a parking area that provides pedestrian access. The repair work also included the creation of a perimeter using native stones and plantings of Catawba rhododendron and mountain laurel. This project was made possible from funding by the Forest Service, Appalachian Trail Conservancy and Carolina Mountain Club. The Carolina Mountain Club and Appalachian 4x4 Club provided 50 volunteers who donated over 280 hours to restore the site with native plantings and soil stabilization. The work was completed over the course of three weeks. Aspects of the project that could not be completed with volunteers were solicited through a contract administered by the Forest Service and awarded to a local contractor. Max Patch sits next to the Tennessee state line in the Harmon Den area. At 4,629 feet this bald offers 360-degree vistas of Mount Mitchell to the east and Great Smoky Mountains to the southwest. An abundance of ferns and grasses blanket the bald, making it perfect for picnics. Fishing is offered at the pond past the main parking lot. Camping is prohibited at the bald. The Appalachian Trail crosses this area. Celebrate National Trails Day in Shenandoah National Park on Saturday, June 1. In partnership with Shenandoah National Park, the Potomac Appalachian Trail Club (PATC) invites new hikers and experienced backpackers to learn new trail skills at PATC Trail Patrol's "Beyond the Trailhead" event at Byrd Visitor Center (milepost 51 on Skyline Drive) from 9 a.m. to 3:30 p.m. Come join guided hikes and hands-on demonstrations throughout the day. With over 500 miles of trails, Shenandoah is a hiker's paradise. There are trails for every goal, from a stroll on the Limberlost Trail to an excursion on the Appalachian Trail. Enjoy the rewards and challenges of hiking to mountain summits and cascading waterfalls, while reconnecting with family, friends and yourself. The National Trails Day event is designed to give novice hikers the information they need to leave their cars behind and venture beyond the trailhead to enjoy Shenandoah National Park's numerous hiking trails. Experienced hikers can discuss new ideas with PATC members at displays on Leave No Trace outdoor ethics and wilderness first aid techniques. Everyone can participate in a hands-on demonstration of the traditional tools used to maintain trails in wilderness, such as crosscut saws, provided by the Shenandoah National Park trail crew throughout the day. A variety of hikes guided by experienced Trail Patrol members will be offered for people of all ages and experience levels: hikes suitable for families with children as well as easy, moderate, and advanced hikes for adults. Hikers will need to meet at the registration table at Byrd Visitor Center 15 minutes before the hike time to sign in. Hikers should wear appropriate footwear and clothing for the season and bring food and plenty of water for all hikes and a trail lunch for the advanced hikes. * Story of the Forest Trail / Easy / 1.8 miles / 10:00 a.m.
* Appalachian Trail Ramble / Easy / 2.0 miles / 10:45 a.m. and 1:30 p.m.
* Dark Hollow Falls Hike / Moderate / 1.4 miles / 9:30 a.m. and 1:30 p.m.
* Rose River-Dark Hollow Falls / Advanced / 3.8 miles / 10:00 a.m.
* Rapidan Camp National Historic Landmark / Advanced / 4.0 miles / 9:45 a.m. Hike end times are estimates; hikes may arrive back at the visitor center sooner or later than the time indicated. Pre-registration is encouraged but you may also register on June 1 at Byrd Visitor Center. To pre-register, send an email to TPNTD@patc.net by May 31. Please include your name and which hike you wish to join. PATC and Trail Patrol are charging no fees to attend or participate in any hike, workshop, or demonstration connected with the event; however, there is a $15-per-car entrance fee to the park (good for seven days). Byrd Visitor Center lies within the park at milepost 51 on Skyline Drive. For more information about the event, visit the PATC website at www.patc.net or contact Trail Patrol at TPNTD@patc.net. For more information on the park, visit the park's website at www.nps.gov/shen. With a growing population of black bears in eastern Kentucky, the Daniel Boone National Forest, which includes the Red River Gorge Geological Area, has issued a food storage order for campers and other visitors. The order is applicable forest-wide. Campers in developed sites must store food, garbage and other odorous items that may attract bears in a bear-resistant container, inside their vehicle, or in an enclosed hard-body trailer. Backcountry campers must suspend food, garbage and odorous items at least 10 feet off the ground and four feet away from any tree or pole. All food leftovers and trash must be properly disposed of in a bear-resistant trash receptacle or other container where provided by the Forest Service. The burning or burying of food trash is prohibited. Odorous items that may attract bears include food, garbage, soap, toothpaste and other scented substances. In Kentucky, it is against the law to intentionally or unintentionally feed a bear. 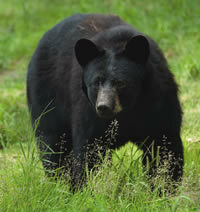 The public should report nuisance bears and any bear exhibiting aggressive behavior by calling 1-800-25-ALERT. As part of a National Trails Day celebration, the Big South Fork National River and Recreation Area will host a day of trail repair and clean-up on Saturday, June 1. The event will be held on the Oscar Blevins Loop and Duncan Hollow Bike Trails from 8:30 a.m. to 2:00 p.m. EDT. Volunteers will meet at the Bandy Creek Visitor Center parking lot at 8:30 a.m. EDT. The National Park Service is partnering with the American Hiking Society on National Trails Day, a celebration that will bring together outdoor enthusiasts across the country on Saturday, June 1, 2013, for the 21st annual celebration of America's magnificent trail system and its countless supporters and volunteers. More than 2,000 nationwide events will take place across the country including trail maintenance, hiking, paddling, biking, horseback riding, bird watching, running, trail celebrations and more! Since 1993, National Trails Day has inspired millions of individuals and community groups to take part in activities that promote healthy living and mental well-being, protect green space, educate youth and adults on the importance of trails, and instill excitement for the outdoors. 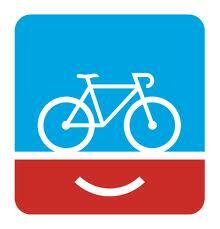 The smiling logo of national bicycling movement PeopleForBikes is found hugging every bottle of New Belgium Fat Tire and Ranger IPA, nationwide through the end of May. PeopleForBikes is a non-profit organization that is on a mission to unite millions of voices to improve the future of bicycling in America and get more people on bikes, more often. With strength in numbers, PeopleForBikes aims to pave the way for a safer, more accessible country for bikes. Alternatively powered, and 100% employee owned, New Belgium’s goal is to maintain an environmentally, socially and economically conscious business by aligning their business practices with nature and its inhabitants. They have helped bike-related non-profits raise over $2 million by selling beer at the Tour de Fat Bicycle Carnival throughout the U.S. Learn more about the company’s sustainable initiatives on their sustainability page. To learn more about what PeopleForBikes is doing to make America a better place for bikes, visit www.peopleforbikes.org. Join the movement by signing the “I am for bikes…” pledge. Paul Lewis from the University of Tennessee and Big South Fork astronomy volunteers will be at Big South Fork National River and Recreation Area on Saturday, May 18, 2013, for two special astronomy programs. A telescope with a sun filter will be positioned in front of the Bandy Creek Visitor Center from 3:00 p.m. to 4:00 p.m. (EDT) to allow for solar viewing. The use of special telescope filters will allow safe viewing of the sun. The sun should never be viewed without proper sun filters or permanent damage to the eyes may occur. Later that evening at 9:00 p.m. (EDT), Paul Lewis will describe which objects to look for in the May night sky. This program will be held in the parking lot across from the Bandy Creek Visitor Center. Telescopes will be available for night sky observation after the presentation. You may want to bring a blanket or chair for comfortable seating. There is no charge to attend these programs. In the event of rain or inclement weather, the evening program will be moved indoors to the Interpretation and Education Building next to the Bandy Creek Visitor Center. Great deals on men's everyday apparel on Clymb365! The Astronomy Club of Asheville will be leading a stargazing event at the Appalachian Highlands Science Learning Center at the end of this month. Located atop Purchase Knob, in the Cataloochee area of the park, the learning center provides one of the clearest views of the sky in the park. Since the program is limited to 60 people, reservations are required for the May 31st event. For more information, and to make a reservation, please call 828-926-6251 or e-mail Susan Sachs at susan_sachs@nps.gov. A day of hikes, lectures and cupcakes is planned to celebrate Great Smoky Mountains Association’s 60th Anniversary on Saturday, June 22nd, at the Oconaluftee Visitor Center near Cherokee, N.C.
GSMA’s legacy of providing financial support to Great Smoky Mountains National Park began in 1953 with a slightly longer name (Great Smoky Mountains Natural History Association) and a $100 start-up loan from Mount Rainer Natural History Association. The organization’s mission in the last 60 years has remained the same – to assist national park visitors by providing educational and other park-related sales items; to build a membership program of those who wish to support the park; and to use the proceeds of both these efforts to contribute to preservation efforts in the most-visited national park in America. GSMA contributions to the national park have been used for a wide variety of preservation efforts, including protecting bears from human interaction, restoring historic structures in Cataloochee Valley, Elkmont and Cades Cove, the fight against threats to the hemlock trees, backcountry rangers to protect the most isolated areas of the park, and archival storage of park-related documents and artifacts. GSMA was instrumental in the effort to bring elk back to the park, as well as worked to ensure the native brook trout population remains vibrant. Most recently GSMA funds have been used to complete a renovation of the Clingmans Dome Information Center, Sugarlands Visitor Center near Gatlinburg, Tenn., and to construct a new visitor center at Oconaluftee, near Cherokee, N.C., both of which enrich the visitor experience by providing interpretive displays, current event information and assistance in planning your national park visit. To preregister for any of these activities, call the GSMA Membership Department at 865.436.7318, Ext. 222 or 254 by Friday, June 14. A second 60th anniversary event is planned for Sept. 13-15 in Townsend, Tenn. That event will feature a full day of similar activities on Saturday, plus dinner and dancing in the evening. Preregistration will be accepted starting in early August. For more information about GSMA’s membership and volunteer opportunities, visit SmokiesInformation.org or call 888.898.9102, Ext. 222 or 254. The Spence Ridge Trail Bridge in the Linville Gorge is closed because of flood-related damage from this weekend’s rains. Located in the north-central part of the gorge, the bridge connects the Spence Ridge Trail (233) and the Linville Gorge Trail (231). In general, the Forest Service encourages visitors to the Grandfather Ranger District, Pisgah National Forest, to use caution when driving on Forest Service roads as heavy rains have caused minor road damage in spots that may worsen with time and additional rain. Forest Service personnel continue to assess road conditions. Great Smoky Mountains National Park is recruiting volunteers to help staff the visitor information center at Clingmans Dome through November 30th. The visitor information center at Clingmans Dome sits at an elevation of 6,300 feet and is a point source of information for the national park and the high elevation spruce fir ecosystem, in particular. Volunteers are needed to assist in educating visitors about the Park while also providing recreational, trip planning, and directional information. The information center, constructed by the Civilian Conservation Corps, originally served as a comfort station, but was converted into a seasonal information center in 2010. It also includes a bookstore area managed by the Great Smoky Mountains Association (GSMA). "In the past, visitors to this popular destination did not have a chance to obtain information on their high elevation visit or have questions answered," said Park Superintendent Dale Ditmanson. "Now with the help of volunteers staffing the center, visitors can inquire and learn about the spruce fir ecosystem and the impacts of invasive insects, such as the balsam woolly adelgid, and air quality." Many other helpful services are available, including the ability to purchase guides and maps, outdoor apparel, and other products sold by GSMA. Volunteers will be working alongside GSMA employees and each volunteer is asked to work at least one four-hour shift per week. About twelve new volunteers are needed to fill all days of the week, but especially from Friday through Sunday. The hours will be from 11 a.m. to 3 p.m. Interested persons will be provided orientation and training before beginning at the contact station. The period that volunteers will be needed is during the peak season, April through November. Training will be held from 9:00 a.m. until 4:00 p.m. on Friday, May 17th. To sign up for training or for more information, contact Florie Takaki at 828-497-1906 or by email, Monday through Fridays. This Wednesday marks the first day of vehicle-free cycling in Cades Cove. From May 8th through late September, the Cades Cove Loop Road will be closed to motor vehicle traffic on Wednesday and Saturday mornings until 10:00 a.m. in order to allow bicyclists and pedestrians the chance to enjoy the cove without the hustle and bustle of automobile traffic. Three years ago the Smokies re-paved the loop road and made it an outstanding destination for road bikes. The 11-mile one-way road provides bicyclists with excellent opportunities for viewing wildlife and touring 19th century homesites. During the summer and fall season, bicycles may be rented from the Cades Cove Campground Store (located near the Cades Cove Campground) if needed. For information call (865) 448-9034. If at all possible I would highly recommend bringing your own bikes. If you wish to explore the interior of Cades Cove via Sparks Lane and Hyatt Lane, you will need a mountain bike or a hybrid. For more information on cycling in the Smokies, please click here. U.S. Senator Lamar Alexander (R-Tenn.) joined Brookfield Renewable Energy Group and The Nature Conservancy at Calderwood Dam yesterday, praising the announcement of their agreement to preserve nearly 4,000 acres of land connecting the Great Smoky Mountains National Park and Cherokee National Forest. The nearly 4,000 acres will ultimately become public land following the transfer from Brookfield to The Nature Conservancy, and will connect the Great Smoky Mountains and Cherokee National Forest. In its agreement with Brookfield, The Nature Conservancy will convey the property over the next two years to state and federal partners, adding to the 6,000 acres that previously became part of the Smoky Mountains and the Cherokee National Forest following the agreement in 2004 to re-license Alcoa's hydropower facilities. Once the transfer is complete, trail crews plan to reroute a section of the Benton MacKaye Trail between Deals Gap and the Smokies so that hikers can stay in the forest and not have to walk along U.S. Highway 129. Saturday, June 1st, is the 21st annual National Trails Day. Friends of Great Smoky Mountains National Park, the Regional Office of the Appalachian Trail Conservancy, and the Smoky Mountains Hiking Club invite you to participate in helping them take care of the Appalachian Trail in Great Smoky Mountains National Park. The A.T. Maintainers Committee of the Smoky Mountains Hiking Club and the Appalachian Trail Conservancy are responsible for maintaining the A.T. and its facilities in Great Smoky Mountains National Park on a continuing basis. With your help on National Trails Day, projects are completed that otherwise would not be accomplished. Also, the registration fees are an important source of funds to make improvements at housing used by A.T. Ridgerunners, the volunteer SWEAT crew, and Rocky Top trail crew in the Smokies. Now's a great time to register to work at this year's event. For registrations postmarked by May 16th, the fee is $20.00 (After May 16th, it's $25.00). Registering early helps the Crew Assignment Committee get workers placed in work groups and increases your chance of being assigned to your hike/work preference. Workers will receive a commemorative t-shirt and a picnic at day's end. See the registration form for details! The picnic will be at Metcalf Bottoms Picnic Area following the workday. If you have any questions you can be email Holly Scott with Friends of the Smokies at hollys@Friendsofthesmokies.org or Phyllis Henry at phyllishenry@yahoo.com. Great Smoky Mountains National Park resource managers plan to release two new predatory beetle species to aid in control efforts to stop the spread of Hemlock Woolly Adelgid (HWA), an invasive insect pest that has devastated hemlock forests throughout the eastern United States. The park began releasing predatory beetles, which feed exclusively on adelgids, as a biocontrol in 2002. Park managers are hopeful that the addition of these two new beetle species will further enhance our bicontrol treatment program. Both beetles, Laricobius osakensis and Scymnus coniferarum, will be released at biocontrol sites throughout the park. L. osakensis beetles come from Osaka Japan where the Smokies strain of HWA originated. 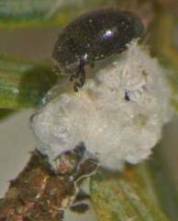 S. coniferarum beetles come from Washington where a similar HWA species occurs and has been kept in check by natural beetle predation. Park managers currently utilize two other beetle species for HWA control including Laricobius nigrinus from Washington and Sasajiscymnus tsugae from Northern Japan. Both of these species are established in the park and are increasing in numbers and in their ability to control HWA. In the long term, Park managers expect beetles to control HWA as populations reach a natural balance as they have in Washington, British Columbia, and Japan. The park employs a three-prong approach in managing HWA that includes foliar applications of horticultural oil in developed areas, stem and soil injections of systemic insecticides (imidacloprid or dinotefuran), and the release of predatory beetles. All of the chemical and biological control techniques are showing positive effects. Currently about 600 acres are being sprayed annually, over 250,000 hemlock trees have been hand-treated with systemic pesticides spread across 11,000 acres, and over 545,000 predatory beetles have been released. Each of these species of HWA predatory beetles are very small black lady beetles and should not be confused with the larger red and black spotted lady beetle that is typically found overwintering in large numbers throughout the area. All introduced biological controls such as the HWA predatory beetles are first quarantined and researched in depth before given approval by the USDA for release. For more information about park hemlock forests, please click here. The Big South Fork National River and Recreation Area announces a birding walk with Dr. Charles P. Nicholson at Bandy Creek on Saturday, May 11. Nicholson holds a bachelor's degree and Ph.D. from the University of Tennessee and a master's degree from the University of Maine and serves as National Environmental Policy Act (NEPA) manager for Tennessee Valley Authority. He is the author of the definitive book about Tennessee's birds, Atlas of the Breeding Birds of Tennessee, and numerous articles about birds and birding in scientific and other publications. Nicholson also taught bird watching at the University of Tennessee for a number of years and is on the board of the Tennessee Ornithological Society. 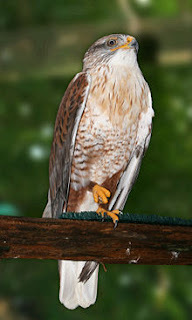 He has over 35 years of birding experience on the Cumberland Plateau in Tennessee, including the Big South Fork area. Participants should meet Dr. Nicholson and park staff at the Bandy Creek Visitor Center at 8:00 a.m. (EDT) and are encouraged to wear sturdy footwear and to bring binoculars and drinking water. The program will conclude by noon. We will first be walking the Bandy Creek Loop trail that starts beside the visitor center. Then we will hike a short distance of the John Litton Farm Loop and return to the visitor center. Over 160 bird species have been documented in the Big South Fork NRRA. Spring is an excellent time of year to observe the park's Neotropical migrants which winter in Central and South America along with the area's year-round residents. Attendees will be provided with a checklist of the birds documented in the Big South Fork for use both during the bird walk and during future birding outings. Both experienced and novice bird watchers are encouraged to attend. Please contact the park at (423) 286-7275 for directions or additional information. Great Smoky Mountains National Park fire management officials are planning a 155-acre prescribed burn in the Canadian Top unit adjacent to Cataloochee Valley in North Carolina. Weather permitting, burn operations could begin as early as Wednesday, May 1, and may continue intermittently through early May. 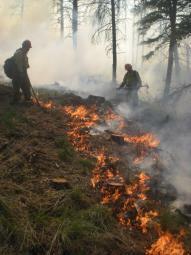 The 155-acre burn tract along Jesse Ridge is part of the larger Canadian Top prescribed burn unit. Fire managers plan to use a series of low-intensity controlled burns over a number of years to restore the composition and open structure of the oak and pine woodlands that occur on upper slopes and ridges within the site. These fire and drought-tolerant natural communities are important to wildlife and overall ecosystem health, and they are in decline throughout the Southern Appalachian region. The burn is being led by the Great Smoky Wildland Fire Module along with the Great Smoky Fire Effects team and the Great Smoky Wildland Fire Engine Crew. "One of the goals of the prescribed burn project is to improve elk forage and habitat," stated Great Smoky Wildland Fire Module Leader and Burn Boss, Shane Paxton. This series of burns will reduce the number of fire-sensitive trees and shrubs while increasing regeneration of oak and yellow pines, and increase the cover and diversity of native grasses and wildflowers. Over time, this increase in vegetation on the forest floor will improve forage for elk which graze the nearby meadows. Roads and trails will remain open to the public. Visitors should expect to see smoke in the area. For more information on the use of prescribed burns in the Smokies, click here. The fact remains that the first American go at Everest will be an event. If we succeed, it will be a feather in our cap, a booster to our prestige, a refutation beyond argument of our detractor’s taunt that we are a nation gone soft and gutless. If we do not, we will at least have entered the arena, joined the rest of the world in one of its great enterprises, abandoned our “isolationism” in mountaineering, as we have long since in other fields. It is still there. It always will be. And it is time we had a look for ourselves. Today, May 1st, marks the 50th anniversary of the first ascent of Mt. Everest by American climbers. To help celebrate this important achievement, a new book about this incredible feat was released today. The Vast Unknown recounts the story of a group of ragtag American climbers who made an improbable and daring attempt at climbing history. Although the world's tallest mountain had already been climbed nine times (or was it only six - there is much debate and controversy as to whether members of the 1960 Chinese expedition actually reached the summit), and numerous attempts had been made in the preceding decades, the Americans would become the first to ascend the unexplored and extremely formidable West Ridge route. New York Times bestselling author Broughton Coburn re-tells the story of the historic climb through the backdrop of the Cold War and the space race. 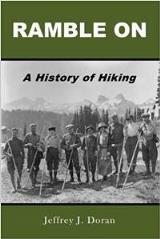 He also provides insight on the early days of climbing in America, where "the Tetons were the nursery for an embryonic clan of innovative and spirited American mountaineers". It wasn't entirely about climbing the mountain, however. There was also a scientific element to the expedition. Psychologists and sociologists were brought along to conduct experiments for NASA, the Navy and the National Science Foundation. A glaciologist was also brought on board to study the Khumbu Icefall. In subsequent years some members of the expedition would play a major role in a little-known espionage mission in the Himalayas. 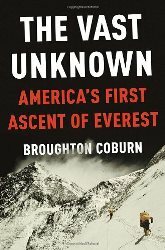 Coburn tells the story of the mission and the team of climbers that were selected by the CIA to plant a surveillance device on a neighboring peak, Nanda Devi, in order to spy into China where Defense Intelligence would monitor nuclear missile testing. All in all The Vast Unknown is an excellent read, even if you're not a climber. From the assembly of the expedition team, to the logistics of moving 23 tons of gear from Seattle to India to Kathmandu, and finally onto Everest Base Camp; and from the triumph of Jim Whittaker becoming the first American to summit Everest, to the harrowing feat of conquering the West Ridge, as well the incredible story of survival - against all odds - during the descent from the peak, this book is an exciting and engaging look at a pivotal point in American climbing history. For more information on The Vast Unknown, or to purchase, please click here.